Institut Patricia Pattyn » Who are we? À l’Institut Patricia Pattyn, we are proud to help Health and Social Services professionals from Quebec and elsewhere develop their French language skills in order to meet their goal: be it to be more comfortable interacting with patients; attending meetings; obtaining a desired position; and/or passing the OQLF French exam. IPP has over 20 years of experience in the field of Health and Social Services. We have assisted physicians, nurses, physiotherapists, social workers, psychologists, as well as middle and senior managers to reach new professional milestones, and career goals. Hospitals, youth centres, and universities are among the clients who trust us to meet their personnel’s needs. At IPP, we are continually developing and updating tools and manuals to better meet the challenges encountered by Health and Social Service professionals in their work or as they prepare for the OQLF French exam. 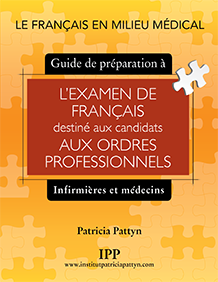 In 2017, we published the manual, Le francais en milieu médical – Guide de préparation à l’examen de français destiné aux candidats aux ordres professionnels. (Mastering French in a medical setting – Preparing for the French exam for Health Professional Practice in Québec: A guide for nurses and doctors.) This manual, prepared explicitly for nurses and physicians, is meant to prepare these professionals for the OQLF French language exam, and to equip nursing students and medical residents to work in French. IPP also has over 15 years of experience in translation in the domains of medicine and social work. Our profound knowledge of these sectors, their culture, and the related language and terminology allows us to deliver documents of an excellent quality. Detailed information on work done for researchers can be found in the section Translation Services. In conclusion, we believe that a structured, goal based approach, tailored to your needs, provided in a respectful and professional manner, will enable you to acquire the skills you need to make French an asset in your career. There is no doubt, mastering French matters!